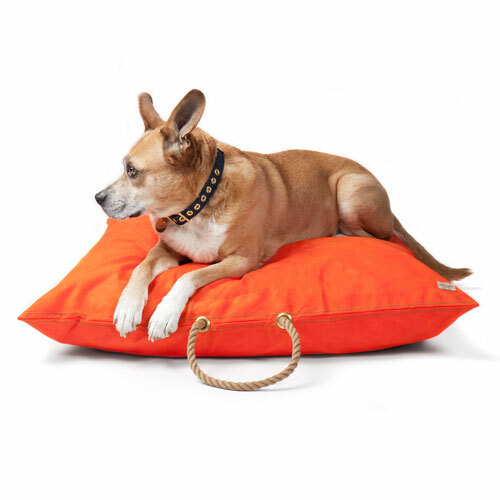 This superior quality, custom-made dog bed is extremely durable and can be used indoor or outdoor. Also doubles as a perfect floor pillow for humans! The cover: Orange waxed canvas, solid brass grommets, solid brass + olive zipper closure, and marine-grade rope. Top stitched with industrial thread for extra durability. The insert: Made from 100% recycled USA shredded pre-consumer foam rubber. The insert will not compress and is easy to fluff and shake out. To Clean: Hose off and let air dry or brush off with a broom. Ages beautifully with time. Re-wax for water resistant finish. Sizes: Medium 30"x30" Large 40"x40"